We have been collecting Carlton Ware for a number of years now, and some time ago at an antiques fair we bought a beautiful bone china plate which was marked underneath ‘Carlton China'. This was the first piece we had seen. Intrigued, we decided to find out more and discovered there was remarkably little known about this type of ware from the makers of Carlton Ware. We decided to find out more and set ourselves a task of collecting at least one example of every pattern produced. Little did we realise what a task that would become. For a start no-one actually knew (or still knows) how many patterns were produced as the majority of records and pattern books were either lost or destroyed. We are still turning up new ones as we scour antique fairs, shops and of course eBay. This site concentrates on the Tea Wares, Figures and Animals produced under the Carlton China name and not on the huge amount of crested souvenir ware which has been documented extensively elsewhere. This website is a source of enjoyment for us, and we hope it will become a reference source for others in the future. 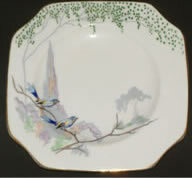 All of the images you will see on this site are of items we have collected, or photos kindly donated by some of the other collectors of Carlton China. Occasionally there will be photos of items for sale on the net if the subject matter warrants it. No photos originate from any copyrighted publication. Historical information originates from various sources, and we would like to thank Harvey Pettit, Peter Goodfellow, Arthur Puffett, Margot Whelan, June and Frank Readhead, Dr. Czes and Yvonne Kosniowski, Paul Waylen and Marian & Trevor Campbell in particular for their input and support.